When it hits me that December is really here, I know it’s time to get serious about finding gifts for family and friends. Whatever your reason for looking for that perfect gift, here are some of the most interesting treats, tools, and treasurers for the gluten-free recipients on your list. I combed catalogues, stores, websites, magazines and blogs to find unique items with price tags of all sizes. Even in this tough economy, I was drawn to gifts that are somehow out-of-the-ordinary and a little bit of a splurge. But this was true whether the gift was an inexpensive stocking stuffer or for a bigger package under the tree. I Can Have That fills a holiday tin to overflowing with dark chocolate, orange cranberries, smoked salmon, Parmesan chips, cookies and pumpkin seed brittle for about $55. Gluten Smart packs everything from margarita mix, to gourmet cheese crackers to chocolate bars in its snack pack for about $50. Gifts Gone Gourmet, which emphasizes artisan made products from California, stuffs cookies, kettle corn, pretzels, dried fruit olives and nuts into a pretty white box decorated with gold stars and ribbon for about $37. Vanilla Spoons doesn’t have a specific holiday gift basket, but you can find themed packages that might be perfect for that special someone. “Mrs. Doubt That’s Not Gluten” includes treats that no one will notice are gluten free for $105. Other gifts include “Movie Mania” and “Mix in the City,” a collection of gluten-free mixes. 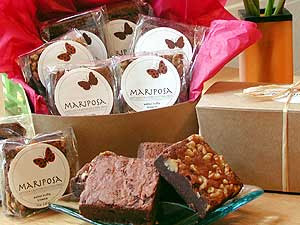 Mariposa, one of our favorite gluten-free bakeries, offers biscotti, brownie and combination gifts packaged in a homey kraft box tied with satin ribbon or raffia. Prices range from about $21 to $38. Frontier Soups has a slightly different spin on the gift basket, filling theirs with hearty soup mixes. The company makes 27 gluten-free varieties. You can build your own soup basket with five to ten soup mixes. A sale going on now offers the basket, crinkle filler and wrapper for $1. Soups cost from $5.50 to $9.95 each. Two smaller food gifts also caught my eye. Do Goodies gluten-free cookies come in a six-cookie gift pack in two varieties for about $10. All the profits from the sale of these cookies goes to the Greyston Foundation, which provide jobs, affordable housing and health care to the underprivileged. You can give a nice gift and feel good about it. I also like Crate&Barrel’s holiday star syrup, a 6.75 ounce star-shaped bottle of pure grade A maple syrup for about $14. While the price might seem a little steep, the bottle is festive and unexpectedly in the holiday spirit. It’s also glass and reusable so that justifies this little extravagance a bit. Gift baskets and gluten-free foods make great useful gifts, but keep mind that you need to order early and that postage will add to the cost. While most holiday gift baskets have a Christmas theme, we found a few gluten-free Hanukkah treasures. The cutest comes from L.A. Burdick Chocolates, a gourmet artisan chocolate company whose products are handmade. You can order a box of nine chocolate Hanukkah mice in a wooden box with a blue ribbon with a silver wax menorah seal for $32. Or you can get 16 pieces of chocolate and one chocolate mouse in the same packaging for $20. Burdick’s website cautions those with allergies, but Carolyn Kohler a sales and customer service representative assured me all the companies chocolates are gluten free. Curious cookie sells both a Hanukkah cookie basket and tin with a label that says, “Cookie, cookie, cookie, I made you out of dough. Cookie, cookie, cookie, I ate them all – Oh No.” The basket has two pounds of cookies for about $40 and one pound for about $27. With Hanukkah so close, you have to order these right away to meet the company’s shipping cut off. With all the time spent in the kitchen, any who is gluten free or anyone who cooks for someone who is deserves kitchen gadgets that work well, look nice and last a long time. And it’s even better to find some that are all three. Although I know you might only use this for special occasions, I love Williams Sonoma’s Oreo Cookie cake pan. It’s actually two pans, top and bottom, that create a cake that looks like an Oreo cookie when you put white icing between the layers. Made with a gluten-free cake mix, I could see this as a big party hit. Williams- Sonoma’s website has a recipe for a chocolate cake that could easily be made gluten free by substituting gluten-free flour for the one cup of wheat flour it calls for. At Target stores, you’ll find sweet, colorful cookie cutters shaped like Santa, a reindeer and a Christmas present. They seemed a size that would work well with tricky gluten-free cut-out cookie dough. For Hanukkah, you might like the snow flake shapes. All are made by Wilton. At about $4 for a set of three they would make a great stocking stuffer or simple gift for one night of Hanukkah. I noticed the Animal House kitchen tools at Target a few months ago and thought they would also make great stocking stuffer especially for gluten-free college kids with their first apartment. The design of each tool incorporates an animal, the piranha pizza cutter for example. You’ll find everything from a Veg Hog veggie brush to a monkey peeler at Target and amazon. Prices range from about $8 t0 $10. I’ve since learned these were featured in O magazine, but I found them on my own first! In keeping with the animal theme, but with a more refined touch, Anthropologie has a charming rooster kitchen timer for $10 that would make keeping track of when those gluten-free cookies are done a pleasure. I also like the retro double kitchen timer that was sold at Anthropologie until it was mentioned in a New York Times gift guide. But not to worry, I found the same timer at amazon for about $10 less at $14.57. One of my favorite gift finds is Anthropologie’s florist bloom measuring cups. For $36, the set included four stoneware cups (1, 1/2, 1/3 and ¼) to pretty to hide away in a drawer and perfect for keeping on the counter within easy reach. A good knife and cutting board are invaluable in a gluten-free kitchen. These two simple, low tech tools can make preparing gluten-free bread so much easier. When I went in search of the best knife, Wusthof is the name that came up most often. Williams-Sonoma pairs an 8 inch Wusthof bread knife with a teak bread board for about $70. I was also interested in Williams-Sonoma’s Kuhn Rikon bread knife, a less expensive choice at about $20. The knife’s 7-inch blade has a non-stick color coating said to cleanly slice fresh-baked bread. Sound perfect for gluten-free loaves. The handle is ergonomically designed and the knife comes with a red safety sheath to protect the blade. When it comes to cutting boards, John Boos is the name on everyone’s lips. A 10 by 10 reversible solid hard rock maple board is one of those gifts that seem to meet my criteria of looking nice, working well and lasting long. The smaller board is about $19 or you can buy up for the larger 16 by 10 board for about $26, both at Cutlery and More. Two things I honestly could not live without in my gluten-free kitchen are my Kitchen Aid mixer, now nearly 20 years old, and my bread machine, a recent replacement for one I had had for nearly as long as my mixer. These are bigger gifts, but you can be sure they will be used again and again for many years. Kitchen Aid is available in many discount and department stores, as well as on amazon for $200 and up depending on the model you buy. Three bread machines seem to work best with gluten free bread, the Zojirushi – the tried and true brand, the Cuisinart, which now has two machines that can be programmed to make gluten-free bread, and the Breadman, which has expanded to three gluten-free programmable machines. They range from $100 to $200 and are available in stores and at amazon and other web sites. I’ve used all three brands and had success with each. It’s likely your gluten-free child has some high tech gift at the top of his or her list, but I found a few low-tech but fun and useful items you might want to wrap and give. For all those times when your child has to tote gluten-free cupcakes to parties and school, Go Go cupcake has cute individual plastic cupcake carriers that look just like, well, a cupcake. A set of two, one “vanilla” with white “icing” and one “chocolate” with pink icing, are about $7 at amazon. For some laughs mixed with learning, you don’t want to miss the new and likely first, gluten-free comic book. Drawn by the nationally known artist who has done Spiderman and other comics, Amy Goes Gluten Free, is the story of a redhead with ponytails, who is learning to adjust to her new gluten free diet. It’s expected to be available from the Celiac Disease Center at Children’s Hospital of Boston this month. If your gluten-free daughter likes to help in the kitchen, Anthropologie has an adorable apron that will make her feel like a better cook the minute she ties it up. Special touches include starry sequins and crocheted snowflakes. Perfect for holiday cookie making, $24. Your gluten-free son might like his own apron from dandy lion designs. You can pick from a variety of fabrics, including airplanes, pirates, tools and trucks. Each apron, which fits children 3-7, can be ordered with cooking utensils, $30. A child’s apron illustrated by the Gluten-Free Illustrator, Erin Rogers Pickering, is also available at zazzle for about $16. A simple T-shirt can also make a nice gift for any gluten-free kid. I am not a fan of the more negative slogans you find on some gluten-free shirts, but I do like the Gluten-Free Kid dinosaur T-shirt in bright blue from café press, $19. This web site has about 900 gluten-free items, ranging from shirts to underwear, to bags and stickers. For little ones new to a gluten-free family, Celiac Chicks has a sweet Onesie with the hip chicks’ logo in soft pink or blue for about $14. For teen girls, try the chick junior ringer T-shirt in three great colors for about $22. Celiac Chicks donates 5 percent of its proceeds to celiac charities. Although I don’t have a photo to show you of the very cool GF Keds offered by ZellaDesigns on zazzle, make sure you check them out for your tween or teen. The body of the slip-on shoe is a bold black and white polka dot with a hot pink GF symbol on each side. You can customize the toe cap and inside, choosing from a tiny floral pattern or red, yellow or green dots or strips. You have to see these shoes to appreciate how different they are. About $60. For girls of all ages who would rather show celiac support on their wrists, Vael Designs, offers an awareness bracelet made with light green Swarovski crystals and an awareness ribbon form $25, with a portion of the proceeds going to celiac research. 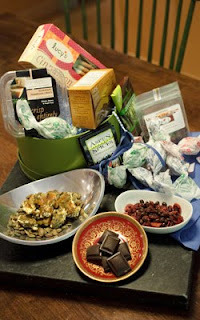 In addition to these gifts, Gluten Smart and I Can Have That sell gifts baskets made for gluten-free kids. It’s not easy to find gifts for our favorite gluten-free guys, but if you know one who loves barbecue, this gifts set from Denny Mike’s might be just what you are looking for. It includes one rub – you can choose from flavors that include Chick Magnet and Cow Bell Hell – and one sauce for about $10. Denny Mike’s is based in Maine, where it’s native son owner has a goal of spreading the gospel of Texas BBQ from Maine to Florida. For something a little more unusual, try Black Forest Bison’s summer sausage gift set, which includes original and garlic summer sausage tied with a raffia bow on a bamboo cutting board for $39. The company is a family operated ranch in Colorado where the animals roam free in the pasture and are grass fed. No hormones, steroids or antibiotics are used. The American Heart Association recommends bison because it is low in fat and cholestrol. The cost of gluten-free beer can make it seem like a luxury, so gluten-free guys of legal drinking age (and perhaps some girls, too) might appreciate of few six pack of Bard’s Tale beer or Redbridge, both of which are increasingly available in beer stores across the country. Heck, you probably don’t even have to wrap it. Just tie a bow on and it’s ready for gift giving. When nothing else seems right, you can always give a gift card. Kinnikinnick sells them in $5 denominations. Although the website seems to indicate you will be charged $10 for postage, that charge is eliminated when you get to check out. Postage for is actually $1. Whole Bakers, a gluten-free cookie company, also offers gift cards from $10 to $250. You can order a card that will be sent to the recipient in the mail or a virtual card that will be sent by email. Wegman’s, Whole Foods and many mainstream supermarkets now carry gluten-free items and sell gift cards, as do many restaurants with gluten-free menus, including Outback and P.F. Changs. In some ways, this gift list involved much more heavy lifting than a trip to the local shopping mall. But I hope it helps you find something special for someone you care about.